There are multiple uses for big data in every industry—from analyzing larger volumes of data than was previously possible to driving more precise answers, to analyzing data at rest and data in motion to capture opportunities that were previously lost. A big data platform will enable your organization to tackle complex problems that previously could not be solved using traditional infrastructure. As the amount of data available to enterprises and other organizations dramatically increases, more and more companies are looking to turn this data into actionable information and intelligence in real time. Addressing these requirements requires applications that are able to analyze potentially enormous volumes and varieties of continuous data streams to provide decision makers with critical information almost instantaneously. IBM® InfoSphere® Streams provides a development platform and runtime environment where you can develop applications that ingest, filter, analyze, and correlate potentially massive volumes of continuous data streams based on defined, proven, and analytical rules that alert you to take appropriate action, all within an appropriate time frame for your organization. 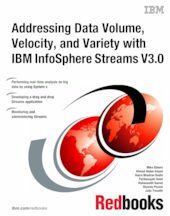 This IBM Redbooks® publication is written for decision-makers, consultants, IT architects, and IT professionals who will be implementing a solution with IBM InfoSphere Streams.